In the region Barpounda are two beaches. 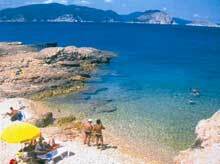 The western beach is rocky and opposite is Skopelos and the islet Agios Georgios. Many times the visitor will see the dolphins playing in the surface of the sea. The second beach, in the southern side has a splendid sandy beach.